I have yet to read sufficient evidence to rule out aliens!! Reehahs, ghostf1re, Stark and 7 others like this. Clamyboy74, Seraphim401 and Squid Surprise like this. Awwwwww, come on guys! If they were aliens they would cut them smaller so they would fit in their drink glass! Of course, they could be really large aliens too ....... ! Clamyboy74, Theinsanegamer, Seraphim401 and 2 others like this. Clamyboy74, Robinson Ochoa, ctm17 and 2 others like this. Like... slow metabolism giant aliens, the earth is like a fridge and they left the door open, ergo, climate change. psycros, Clamyboy74, Theinsanegamer and 1 other person like this. Glacier ice is awesome for keeping your drinks cool. Always a good phenomenon to point out to creationists who harp on about the chances of things happening in nature. But it looks designed! There is higher intelligence at work! Etc. No, they don't happen like this that often. That doesn't mean it can never happen. Same thing with Rogue Waves. They happen rarely, but that does not mean that the hand of creation swept through the water to unleash a terrible deluge. Well apart from this evidence for strange shaped icebergs but absolutely none found whatsoever supporting the fable of a global flood. Why does the photograph only show part of the ice chunk? 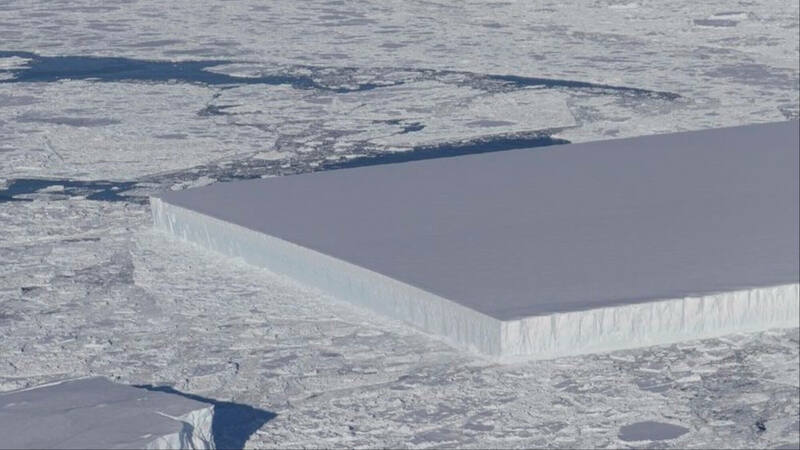 I call BS on this being naturally occurring, especially if all six sides are equally sized. We can't tell though because the whole thing isn't photographed. I checked NASA's site briefly and couldn't even find this photo there. Something smells fishy here... Is it April 1st already? That's assume !!!! Nature did it again. wiyosaya and Robinson Ochoa like this. Whoever you are. Wherever you're from. We're not impressed! Just because you have a weapon that can slice through a glacier as if it were a wedding cake, doesn't mean we're just gonna surrender! No sir-ee! It's Earth you're dealing with here! We have lasers, too, you know. And our leader is orange, and really belligerent! ctm17 and MilwaukeeMike like this. I don't doubt NASA on this but that's the fakest looking real picture I've seen in a long time. Or maybe it's the Governments of the world purposely cutting it to push some sort of agenda with global warming? 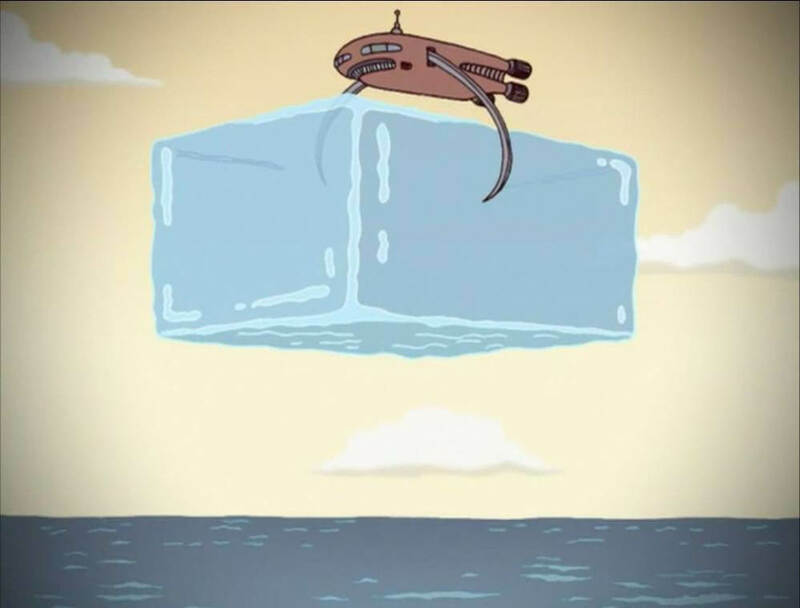 Man oh man!That sucker would make a Lot of iceberg RUM! Newfoundland style..
so dense it takes way longer to melt than your tray ice cubes.we harvest sea ice here.for just those purposes. Tow it somewhere where they need the fresh water. No way. Governments aren't even vaguely that competent, especially when attempting to work together. Have a look at this. I did not find it all that hard to find. As far as it not showing the whole thing, the photo was shot from an airplane. There's two photos here as there were two ice bergs found. The second photo is the photo in the TS article. Many different cultures have fables of deluges. If you think about those fables, their world was their territory. Therefore, anything that would have destroyed their territory effectively destroyed their world. Two examples come to mind: One from native tribes in Ontario, Canada - for which science thinks they found fossil evidence from maybe 14,000 years ago - IIRC, and one from the Mediterranean area where there appears also to be fossil evidence, from perhaps 20,000 years ago - IIRC. Fossil evidence of a deluge on a global scale, though, in the time frame of humanity's reign, no. Science is even a bad word in the US government these days. It is almost surprising to me that NASA, itself, has not been banned. Strangely they seem to want to fund NASA more, or at least give them more attention(plus space force). Congress at least dished out massive amounts of money to science, including NASA, on the two year spending bill. Most of the organizations saw there highest budgets since pre-recession. There are a lot of recent findings that suggest a serious of fast, large-scale flooding events occurred in several places around the globe between 12,000 and 8000 years ago. If those events turn out to have been connected, perhaps via a series of geological upheavals, then its quite possible they happened within a single human lifetime. There's little doubt that stories would have been passed on..we already know that human oral history goes back at least 6000 years and there's no reason to think it couldn't be much older. That practice was very important to ancient man. I've been waiting for the Elon Musk tweet announcing his new venture to deliver fresh water to all drought plagued areas of the planet, eventually Mars even!